If you haven’t already seen it, Saturday Night Live’s sketch last week with Jean Valjean as a singing lobster is utterly bizarre. And it gets stranger as it goes along. This entry was posted in Reviews and tagged Jean Valjean, Musical, Parody on April 28, 2018 by Kelson Vibber. Malinda Kathleen Reese’s “Google Translate Sings” project returns to Les Misérables with “On My Own,” run through several layers of Google Translate from one language to another to another and finally back to English. As she says, it’s a good thing they had Hebert Kretzmer to translate it the first time around! This entry was posted in Reviews and tagged Eponine, Musical, Parody, video on July 9, 2016 by Kelson Vibber. A local theater company put together a cabaret-style parody of Les Misérables, built around the idea that you were visiting Thénardier’s inn for drinks. “Witness the heartwarming tale of human compassion, told by a complete a—hole.” It’s the kind of event where the doors open early and the actors are already in character, milling about and interacting with the audience, feeling out who’ll be a good choice to pull into a participation bit during the show. I really wasn’t sure what to expect, but it turned out to be a lot of fun. M. Thénardier served as narrator, telling the story but putting his own spin on it. They built off of the musical, playing some parts mostly straight — Valjean, in particular, was *always* earnest — while others went completely over the top. Many characters would switch back and forth between serious and comedic, sometimes within a single song. Javert, for instance, would sometimes be deadly serious, and at other times show an entirely different reason for his obsession with Jean Valjean. Somehow they actually managed to make “A Little Fall of Rain” funny…and touching. The actors were clearly enjoying themselves as well, which is key for interactive shows like this. Creating Arts Studios in Santa Monica is pretty close to the freeway, on the edge of a business park. There’s no parking lot to speak of, but there was plenty of street parking on the residential side of the street and no signs indicating any prohibition on parking there. They’ve got a similar project in the works, Chicabarent, mashing up Chicago, Cabaret and Rent and set in a speakeasy, which should be fun based on this show. 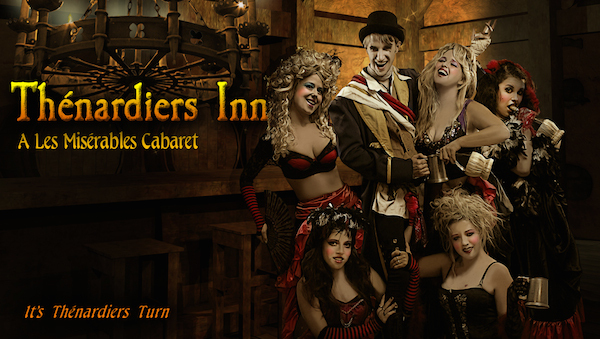 Thénardier’s Inn ran for three weekends in November 2014, and has been extended for a second run in January-February 2015. This entry was posted in Reviews and tagged Musical, Parody, Thenardiers on December 8, 2014 by Kelson Vibber.